Experiment details: "RNase T1 (30 mg/mL) was denatured, and all exchangeable NH groups were deuterated by incubation in 5 M GdmDCl, 50 mM acetate-d3, and 99.8% D2O at pD 5.4 at 25 C for 24 h. The protein was allowed to refold (6-7500 ms, 25 C) by a 5-fold dilution into 0.1 M acetate-d3 and H20, pH 5.0 (or D2O, pD 5.4, for folding times >1000 ms), using a Bio-Logic QFM5 rapid-quench instrument. 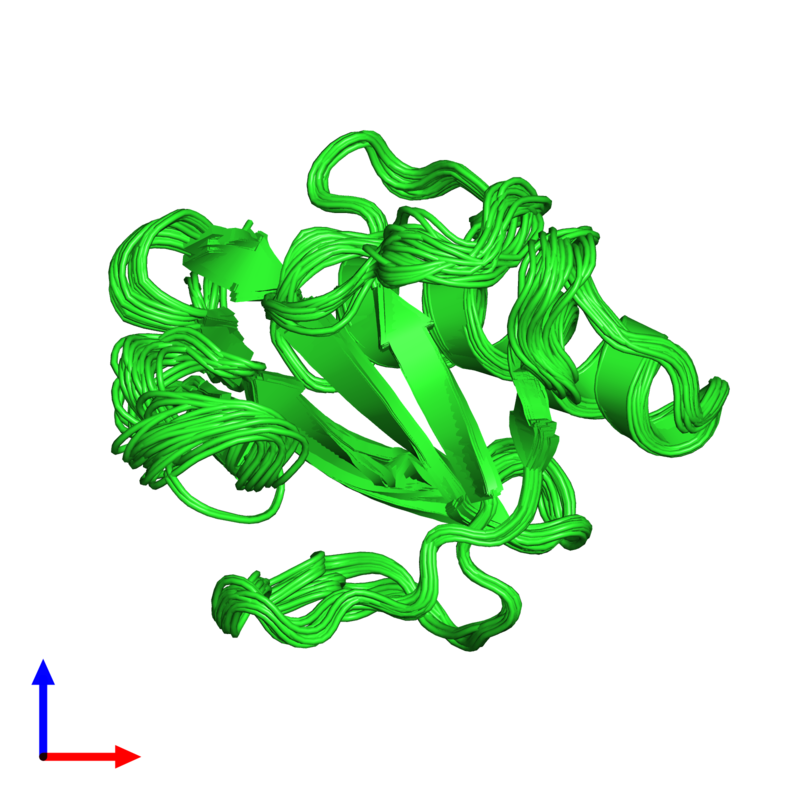 The refolding protein was diluted 5-fold (D2O refold) of 2-fold (H2O refold) into 0.3 M phosphate (H2O), pH 9.8, for a 50-ms labeling pulse. The pulse was quenched by a 2-fold dilution into 0.4 M acetate-d3, pH 4.5, and the sample then placed on ice. The final pH values of the three phases (refolding, labeling, and quench) were 5.0, 8.5, and 5.0, respectively." Experiment details: "For the competition between H/D exchange and refolding at 10 °C, 5 mg of protonated 15N-S54G/P55N-RNase T1 was unfolded in 50 μl of 6.0 M GdnHCl, 10 mM sodium oxalate, pH* 5.0. Refolding was initiated by adding 450 μl of D2O refolding buffer, 10 mM sodium oxalate, pH* 5.0. After 9 h, a 2D 1H-15N-HMQC spectrum was recorded." Experiment details: "H/D exchange of native 15N-S54G/P55N-RNase T1 was followed for 13.5 h by a series of 128 2D 1H-15N-HMQC experiments after dissolving 5 mg of protonated protein in 450 μl of D2O/H2O (9/1), 0.6 M GdnDCl, 10 mM sodium oxalate, pH* 5.0, equilibrated for 10 min at 25 °C. A single exponential function was fitted to the respective decaying intensities of the amide cross-peaks." Experiment details: "The lyophilized protein was first dissolved in H2O and allowed to incubate at room temperature for at least 18 h. The samples were then diafiltered and concentrated into 25 mM acetate-d3 99.8% D20 buffer, pD 5.6. Final sample concentrations were 2 mM. The samples were frozen or kept briefly at 4 C until the commencement of data acquisition. Magnitude COSY spectra were recorded at 25 °C on a Varian Unity 500 spectrometer."